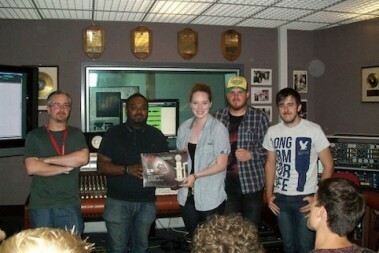 The “very successful” Gus Dudgeon Foundation (GDF)/Joint Audio Media Education Support (JAMES) postgraduate summer course concluded in style on 19 July, with the nine students, under the tutelage of Romesh Dodangoda (pictured), producing a track for up-and-coming Welsh rock group Caesars Rome. “It was an honour to be asked to lead this year’s Gus Dudgeon summer course, and it was a pleasure to share my experiences with the very talented students,” comments Dadangoda. “I was very impressed with the high standards of everyone in the class, and also their interest in learning as much as they could from each day of the course. “It was also great to give the students an insight into my way of working with a band and how I deal with any issues along the way,” he continues. “I think teaching students troubleshooting and how to keep a session running is really important, and hopefully everyone took away some new ways of dealing with problems on sessions. The students learnt about some of the drum micing techniques I like to use, as well as various approaches of recording guitars.